The sunrise in rural central Michigan reveals a landscape of neatly divided cornfields crossed by ditches and wooded creeks. But few of the sleepy teenagers on the school bus from Maple Valley Junior-Senior High School likely noticed this scene on their hour drive to Grand Rapids. They set out from their tiny school district of about 1,000 students, heading to the closest big city for a college recruiting fair. About 151 colleges and universities were waiting. The students, from Nashville and Vermontville, Mich., were going to the recruiters because few recruiters come to see them. For urban and suburban students, it's common to have college recruiters visit their schools — maybe they set up a booth in the lunchroom, or talk with students during an English class. But recruiters rarely go to small, rural schools like Maple Valley, which serves fewer than 450 seventh- through 12th-graders. "When we think about an urban high school, a college recruiter can hit 1,500 students at a time," says Andrew Koricich, a professor of education at Appalachian State University. "To do that in a rural area, you may have to go to 10 high schools." Rural households also have lower incomes than urban and suburban ones, the Census Bureau reports, meaning that rural students are less profitable for colleges, which often have to offer them financial aid. "People tend to overlook the rural areas. I think it's kind of disappointing because some able students could get looked over," says David Hochstetler, one of the Maple Valley students riding the bus to Grand Rapids. He's interested in pursuing engineering or computer science in college. One recent study by researchers at UCLA and the University of Arizona found public high schools in affluent areas receive more college recruiter visits than schools in less affluent areas. Those researchers also found recruiters from private colleges concentrate disproportionately on private schools. Rural areas usually have neither wealthy families nor private schools. David Morrow, principal of St. Francis Community Junior/Senior High School in the northwestern corner of Kansas, says only a few public regional institutions visit his combined middle and high school of about 130 students. Kansas State University visits, but in the last five years, the University of Kansas visited the school only once. In Sparta, Ga., just a few regional institutions visit the 230-some students at Hancock Central High School, according to counselor Carlton Stewart. The University of Georgia doesn't come, Stewart says, and Morehouse College only recruits for a summer program for high schoolers, not for admission. This anemic outreach is among the reasons comparatively low numbers of high school graduates from rural areas end up in college the following fall — 59 percent, compared to 62 percent of urban and 67 percent of suburban high school grads, according to the National Student Clearinghouse, which tracks this. At Maple Valley, graduation rates are above the national average, but only 45 percent of Maple Valley's 2018 graduates enrolled in college. "Providing greater postsecondary opportunities for rural residents isn't simply a matter of equity or moral obligation — it's a matter of continued national prosperity," says Appalachian State's Andrew Koricich. He points out that our economy relies heavily on rural communities and workers. Colleges that get most of their students from urban centers have only recently begun to consider rural student outreach as a deliberate part of their recruitment strategies, says David Hawkins of the National Association for College Admission Counseling, or NACAC. Some selective colleges are noticing the importance of rural America, perhaps spurred by a dramatic enrollment decline and the attention that came with the 2016 elections.. According to Patricia McDonough, an education professor at UCLA, they've realized that "selective institutions should have a broader range of representation of types of students related to the types of adults we have in America." Colleges that do try to recruit at rural high schools or regional recruiting fairs have cultural obstacles to overcome, too. 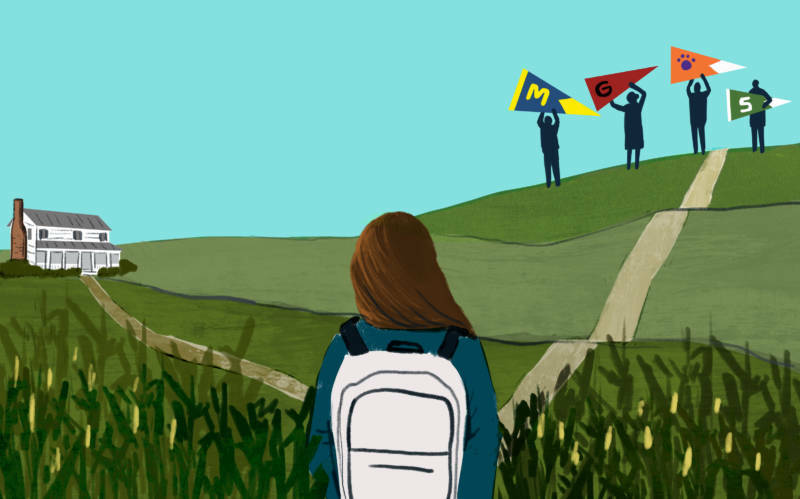 In her research, McDonough has found even the smartest rural students tend to be reluctant to move far away to go to college. "It's kind of a golden cage," she says. "You don't want to leave home, family — a way of life that you know and love." "I'm used to smaller settings, not bigger settings," explains Britani Shilton, a Maple Valley senior and four-sport athlete. Going to a big state school would be really overwhelming, she says. "I went to Michigan State for a basketball camp one time, and there were so many people there. I was like, 'Whoa! I don't know what to think about this.' "
Rural parents can also be skeptical of higher education in general, says Julia DeGroot, Maple Valley's college counselor. DeGroot is the daughter of Grand Rapids white-collar professionals and went to a private high school. For her, she says, "college was never, 'Are you going?' It was, 'Where are you going?' " But at Maple Valley, she says, "That's not the case for these kids." "One of the biggest struggles is getting the parents to see that big picture where, 'It's OK if my kid goes away to college for four years. It doesn't mean that they're never coming back.' "
Overcoming such perceptions means not only reaching rural students where they live, but getting them to visit campuses, says Andy Borst, director of undergraduate admissions at the University of Illinois at Urbana–Champaign. "Students come to campus with reluctance, feeling that it may be too big. Once they get there and talk one-on-one to a current student, faculty person or admissions staff, they tend to be less frightened," Borst says. But it's not always easy for rural students to visit a campus. "You have to drive a long distance to actually get somewhere that's an actual place," explains Maple Valley senior Sarah Lowndes. David Hochstetler, the Maple Valley student interested in engineering, met with representatives from Michigan Technological University at the college recruiting fair in Grand Rapids. That meeting helped him decide to attend. The school also sent him an invitation to apply as a "select nominee." He applied and was accepted early and given a yearly academic scholarship. hours away by car, because his family vacations on the Upper Peninsula. There, he took a college tour and connected with current students over his passion for engineering. "Around here [home], there aren't that many people on the engineering or computer side of things, " he says. "I thought it would be cool to go into a community of nerds like me." This story about rural college-going was produced by The Hechinger Report, a nonprofit, independent news organization focused on inequality and innovation in education. Copyright 2019 The Hechinger Report. To see more, visit The Hechinger Report.